Avoid accidental poisonings. This applies to medicines and many household substances. Some common household items and everyday medications are surprisingly dangerous. For example, flavored toothpastes can be tempting to kids, but if children swallow a few mouthfuls, the fluoride can cause serious problems. Another surprising danger is automatic dishwasher detergent. It’s strong enough to clean your dishes without you scrubbing them. If a child swallows a mouthful, it could burn his throat. Fragrances like lemon or orange make cleaning products more tempting to children. Children’s vitamins can also tempt young children to eat them like candy—but they aren’t. And too many vitamins can be dangerous. Keep everything out of reach or securely locked so that kids under the age of five cannot get to things that could poison them. If your child does get into something, or if you think that he might have gotten into something, stay calm and call your regional poison control center. Use child-resistant caps. 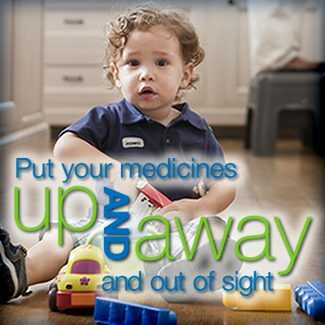 Make sure all medicines in homes where children live or visit have child-resistant caps. Be sure to put the cap on correctly and tighten it when you’re finished taking or giving the medicine or a child could still get into it. Keep a list. Make sure your child’s health care professionals know all the medications your child is taking, whether prescriptions or over-the-counter medicines, like vitamins or dietary supplements. When it’s time for your child’s annual checkup, bring all of your child’s medicines and supplements with you to the appointment. This serves as a reminder to talk about the medicines and discuss any problems. Mention allergies and reactions. When your child is getting a new prescription, make sure the health care professional is aware of your child’s allergiesand reactions to medicines. Make sure you understand. When the medication is prescribed and when you pick up the prescription, make sure you understand this important information: What is the name of the medicine? What is it for? Is this the right dose for my child’s weight? How often should my child take this medicine and for how long? Should I give the medicine throughout the night or just during the day? Is this medicine safe with my child’s other medicines? Are there any foods, drinks or activities my child should avoid while taking this medicine? When should my child start improving? Take measure. Make sure you understand the proper dosage before giving medication to your child. Medications for children are sometimes dosed by the “dropperful” or by the teaspoon. The definition of a dropperful may not be clear. It may mean to the upper mark on the dropper or filled to the top. Or some parents may use a dropper other than the one that came with the product, which may not be the same size. Even small variances in dosage can be critical in small children, so make sure you understand the directions. Keep the product dropper with the product, and use only the dropper that was supplied. If it calls for a teaspoon or tablespoon measure, don’t use a household spoon. Use a measuring spoon or a marked plastic syringe provided by your doctor or pharmacist. Remember that some infant medicines may be more concentrated than similar medicines for older children or adults. Don’t assume that you can give a baby 2 teaspoonfuls of infant medicine, just because you give your older child 2 teaspoonfuls. Always read and follow the label instructions. Know the side effects. If you know what side effects could occur, you will be better prepared if something does happen. If your child experiences side effects, alert the doctor and pharmacist right away. Create a chart. Children’s medicines often taste good, so if you ask a kid if he’s had his medicine, he may say no—just to get another dose. Create a chart or list to help you track which medicines were given at what times. This is especially important if your child is taking several medicines or several people are involved in the caregiving. But it’s not a bad idea in any busy household—and what household with kids isn’t busy? © 2011 HealthyWomen All rights reserved. Reprinted with permission from HealthyWomen. 1-877-986-9472 (toll-free). On the Web at: www.HealthyWomen.org. This entry was posted on Saturday, January 28th, 2012 at 7:16 am and is filed under Uncategorized. You can follow any responses to this entry through the RSS 2.0 feed. You can leave a response, or trackback from your own site.